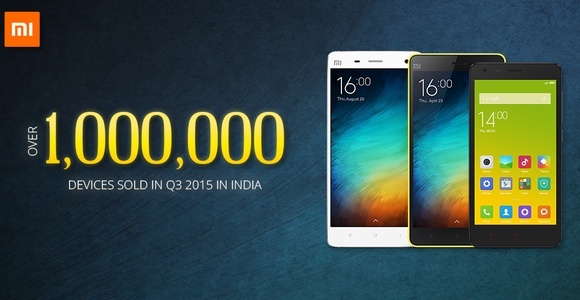 While Huawei and Xiaomi fight for the crow in China, the later enjoys an impressive growth on the Indian market. Although Huawei and Xiaomi are selling impressive amounts of handsets in their home market, focusing solely on China is not a smart choice in the long run. In the last few years, names like ZTE, Huawei, or Xiaomi began to explore other markets and also added premium handsets to their portfolio, trying to take on the big ones like Sony, Samsung, HTC, or Apple in both the US and Europe. While India is not a very large market for flagships yet, mid-rangers and low-end models have been selling in big numbers lately, and Xiaomi managed to catch the wave. Former Googler and current Xiaomi Global VP Hugo Barra, posted the following message on Twitter at the end of last week: "Xiaomi India: we sold over 1M units in Q3, our best quarter ever! And 45% QoQ growth in 2015." In an interview with CNET, Xiaomi revealed that the company's best seller in India is the $105 USD Redmi Prime 2. In India, the most popular smartphones fall in the $100 USD to $150 USD price range, one of the main reasons for handsets part of the Google Android One initiative to sell well below the expectations. Unfortunately for Xiaomi fans in the US, the company has no official presence on North American soil yet.